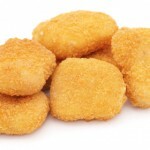 Home » Nutrition » Kids Nutrition » Chicken Nuggets: Are They Really That Bad? Chicken Nuggets: Are They Really That Bad? It depends. Some chicken nuggets include the skin, added salt, and batter that can contain twice as much saturated fat (than without the batter).However, oven-baked chicken nuggets made of white meat chicken breast in place of fried chicken nuggets can be quite healthful. So when cooking at home or buying store bought items, it’s important to read the ingredient list and food label and then prepare foods in the healthiest ways possible. To save money and keep your heart healthy, try making your own nuggets! Start by cutting up chicken breast (without the skin) or by buying chicken tenders, then dip the chicken pieces in egg whites, and roll in seasoned bread crumbs for a healthier nugget. Again, be sure to bake, not fry, to avoid unhealthy saturated fat or oxidation of oils. Kids like the appeal of bite-size pieces –so they’re a hit in a lunch box served cold with ketchup. Pair chicken nuggets with a salad full of bite size grape tomatoes with a yummy low-fat salad dressing and/or serve with pre-cooked frozen sweet potato fries, a healthier alternative to the loved French Fry (again, just be sure to read the labels). When dining out, chicken nuggets are often found on the kid’s menu. Why limit your child to the kid’s menu? Choose a healthy appetizer and one or two veggie sides (coleslaw, hummus, or side salad). Then share part of your entrée with your child. Fish, bean or chicken taco dishes can be good selections to share because they often include 2-3 tacos. If you’re out at a fast food restaurant –get on-line first and read the labels. Pick the entrée with the lowest saturated fat content and lower total fat grams. Compare your choices before your next order –having the right information on hand is half the battle of making good choices. « My Child Won’t Eat Breakfast. What Should I do? Comment on Chicken Nuggets: Are They Really That Bad? My 5-year old son LOVES chicken nuggets and I am forever worrying about their nutritional value. Thanks for the information. I loved your article on chicken nuggets and the healthy way to prepare them. I am going to put them in my son’s lunch box! By the way, your SuperKids “kids” page is AMAZING! The vibrant colors and activities are great. I’m going to try making my own nuggests as you suggest…seems simple and much more healthy. Thanks!